Okay, Upper Deck might have to give a ruling on this card. I've been talking to some people who know the Japanese rulings and there are a couple of things you should know. First of all, this is one of those Traps where you have to satisfy the condition first before you can activate it (like you can only activate Mirror Force when your opponent's Monsters attack). So, when you discard a card (ie for Magic Jammer or Tribute to the Doomed), you can activate Forced Requisitition. Once it is face up, you finally get to use the effect. So you do NOT get the effect immediately the first time. Today we look at forced requisition, This card forces the opponent to discard a card whenever you discard a card from your hand. This card is good, but only when put in certain decks. If you find yourself constantly discarding cards from your hand because you have more than 6 cards in your hand, this card is perfect for you. Also, you can combo this with magic jammer or tribute to the doomed to also force the opponent get rid of a card. I give this card a 3/5. Though it isn't for every deck, I think it works best in a hand disruption deck or a stall deck. Well. Basically, whenever you discard a card or cards from your hand your opponent loses the same amount of cards from their hand. This card is a pretty nice tech to those hand destruction decks. But i think this card will stay as sideboard material. Its a continuous trap card so heavy storm will target this sucker fast. Provided that your opponent actually has it or draws it. Its an okay card but eh its nothing major. This card will only see play if certain cards in Servant are not restricted. I doubt it will ever be in a Main Deck but that will depend on your local tournament environment. This card's currently one of the strongest cards in the set because the restricted list hasn't been updated, it's proven really useful in playtesting but like I said things will probably change once the restricted list is updated. This card is similar to 'Robbin Goblin in a way. However, it dosen't come near being as effective as it. beign a continuous trap it is the subject to attacks from Heavy Storm, Mystical Space Typhoon and even the rare Giant Trunade. 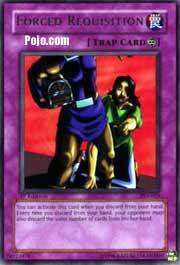 Hand disruption is a good strategy in Yu-Gi-Oh! since there are so little card drawing options, recovery is hard to do. There are better choices however, 'Robbin Goblin is just superior to Forced Requisition. Although, if used together, your opponent will have a tough time keeping a hand. My rating: 3. It's average at best. Introduction: You Card Destruction? Oh discard 5 cards from your hand! gets a 2.5. It's not good or bad, but it has potential! Conclusion: Force your opponent to discard cards is evil :-).